I was thrilled to be profiled in Fast Company’s Generosity Series this week. Generosity is baked into my DNA and I can’t help it. I don’t do this with an expectation of any return–financial or otherwise. I’ve been volunteering for community causes since I was a kid, something my family encouraged. I grew up at the Jersey Shore. When I was in the third grade, I volunteered to bake cupcakes to help fundraise for Lucy the Elephant (who thankfully survived super storm Sandy). Now a parent with my own children, I involved my kids when they younger when I was fundraising for Cambodia or Creative Commons, We have dinner table discussions on why it is important to support causes, particularly programs in Cambodia like the Sharing Foundation. Growing up, my kids have posed for photos in t-shirts, emptied their piggy banks, helped me make fundraising videos, contributed clothing or other items to drives at school, and have attended lots of fund raising events. 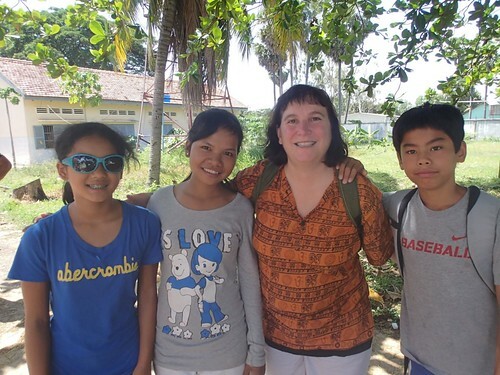 Recently, our family took a homecoming trip to Cambodia where my kids were introduced to their birth country – and got to see the work of the Sharing Foundation first hand. They even got to meet Keo Savon, the young Cambodian women that we are sending to college by donating the royalties from my book, “Measuring the Networked Nonprofit” to the Sharing Foundation. I also want to them to discover and follow their own sense of social activism and philanthropy and become Philanthroteens, teens with a passion for social change who grew up not knowing what it was like to not to have a cell phone or not to be connected to Facebook. The media has dubbed this generation “Qwerty Monsters”; they send hundreds of text messages a day and don’t even like to use their phone for calls. But it is more than the technology, it is also their passion to do good in the world. I recently keynoted the Social Good Brazil Conference in November. I loved hearing about Isadora Faber, a preteen girl who lives in Florianópolis and is the creator of the page Daily Class on Facebook, which aims to help other teens in her country who want to make a difference in their communities by reporting problems in their schools. While her parents were concerned about her safety, she kept going. Faber is a Philanthroteen. 1. Help Them Learn More About Nonprofits: YouthGive is a site that helps young peole and their families easily donate to charities while learning more about the organizations. The organizations listed are profiled by other young people. 2. Let Your Kids Choose: Get a gift card from Razoo and let your kids tell you how to spend it. 4. Set up a Spend, Give, and Save Allowance Policy: For younger kids, here’s a nifty piggy bank, with separate slots for investing, saving, spending, and donating is a great way to teach kids about devoting a portion of their income to charity. 5. Encourage Them To Give Their Time: Teach your kids that even if you are cash poor, you can donate your time to help a nonprofit, whether you are helping to sort food at a local food bank or contributing your professional skills to a nonprofit, can have an enormous social impact. Here’s some resources from VolunteerMatch if you want to volunteer your time to help out hunger organizations. And it can be a rewarding experience. What other stories, tips, or resources would you add to this post? Beth, another great article! I don’t have any children of my own; however I have the joy of being “Aunt Stephanie” for quite a few kids. You’ve provided some great ideas for me to use to help them see how important it is to do good things for others and how easy it is to give back! Wishing you and your family a wonderful holiday season and an amazing 2013! Hope it inspires your readers to think of ways they can make their mission child friendly! I love that you’re encouraging the types of activities with kids. The Glue Network gift cards offer very tangible charitable projects that the recipients can choose among – that are easy for kids to understand. Great ideas. I also always involved my son in philanthropy. When he was in second grade he decided he wanted to create a cookbook (we had a tradition of concocting new recipes and baking cookies together every Wednesday night) with all of his creations. He wanted to sell them, but insisted that a % go to the nonprofit for which I currently worked. I was so proud! Also, many times I would encourage the donors with whom I worked in setting of donor advised funds to meet annually with their children when it came time to make decisions about where they would recommend philanthropic distributions. These meetings always turned into wonderful family traditions — and many of those kids have gone on to become thoughtful philanthropists in their own rights. Help us raise $10,000 today! If everyone viewing this would sponsor us by donating $5, our fundraising of $10000 would be over by now. But not everyone will or can donate and that’s just fine. You’re unemployed, or broke, or living on a fixed income. We understand that. There’s nothing to explain and nothing to apologize for. No one needs to be making a choice between helping us out and eating. You glomoney account will not be limited neither will we charge you extra for not donating. Why do glomoney need donations? Every time we do this, people invariably ask me: “What are you trying to pull here? Why do you need $10000? Web hosting is only $19.99 a month or less! This is a commercial website! Who are you trying to kid? You get your business/profile listed for supporting us. Get East African market by just making a small donation (over 5.5M members). We arrange donors as per the amounted donated and provide a link to either their website or anywhere they so wish as long for one year. You support innovation, you support hard work, you allow us to serve you better. Allow us employ other. By donating $20 we are able to give employment to 1 person. If we reach the goal, we will employ more than 20 people, guranteed. Today, consider donating $5, $10, $20, anything you so feel to help grow glomoney. Hi Beth! Thanks so much for writing this post. As a parent I’m always looking for ways to engage my 9 and 12 year olds in giveback activities. I love organizations like Koodooz which are developing new tools and approaches for this. BTW, if anyone is interested in developing a family giving plan, check out my friend Steve Ketchpel’s new book “Giving Back: Discover your values and put them into action through volunteering and donating.” It has lots of great suggestions on how to involve your kids in giving in an intentional and practical way. I love to hear about kids being involved in charitable events especially, when it is there idea. This article brought a huge smile to my face because just think, what if everyone was wired this way?